click here to open this newsletter in your Web browser. Just over a month to go until Read Captions Across America™ Day! The third-annual Read Captions Across America™ (RCAA) celebration will be held on March 3rd. Read this month's newsletter to familiarize yourself with RCAA and to help you plan RCAA activities for your family, school, library, or group! Learn about captioning for DVDs and the Internet. In his article, DVD and Web Captioning, DCMP Information Technologist Kevin Jones introduces readers to the basics of captioning for DVD and Internet streaming media formats. As video moves from analog to digital mediums, there are many new opportunities for bringing improved accessibility options to deaf and hard of hearing viewers. Calling all teachers of students who are deaf or hard of hearing. Teachers and educational professionals are encouraged to participate in the Fourth Annual Survey of Assessments and Accommodations for Students who are Deaf or Hard of Hearing. This survey is affiliated with the University of Texas at Austin. For more information, or to learn how you can help to spread the word to other teachers and professionals, please e-mail Dr. Stephanie Cawthon at the University of Texas. For the third consecutive year, DCMP is partnering with the National Education Association (NEA) to celebrate Read Across America, observed in conjunction with the birthday of beloved children's author Dr. Seuss. Now in its 11th year, NEA's Read Across America program is designed to "focus the country's attention on how important it is to motivate children to read in addition to helping them master basic skills." By launching Read Captions Across America™ in 2006, DCMP established the first national reading event to emphasize the importance of captioned media as a reading tool for all children, not just those who are deaf or hard of hearing. Since the first RCAA in 2006, thousands of students have participated in events—typically held in schools, libraries, and at home—designed to highlight the literacy benefits of captioning. Many DCMP members have participated in RCAA or similar events in the past, and we're always looking for new ideas and fresh perspectives about how to make event planning more interesting and engaging for kids. E-mail our communications services specialist to share with us your ideas, photos, and stories, or to request a free poster or bookmark to use for your RCAA event! Horton Hears a Who to be released with captions and description! 20th Century Fox presents the timeless Dr. Seuss classic Horton Hears a Who, a story about a good-natured elephant who is determined to save the residents of a town so tiny that it sits on a speck of dust. The only problem is that Horton is the only one in the jungle that can hear the cries for help. Horton Hears a Who is currently scheduled for a March 14th nationwide theatrical release, which is right on the heels of Read Captions Across America™. 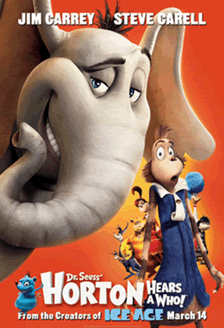 The good news is that Horton Hears a Who will be available with captions and description in selected theaters! The Media Access Group at WGBH will provide Rear Window® Captioning and DVS Theatrical® description for theaters equipped with MoPix® systems. Media Access Group will also provide captioning and description for theaters that have the DTS Digital Cinema system installed (these theaters utilize the same closed-description system as MoPix®). MoPix® (mopix.org)–Learn about current and upcoming releases available with Rear Window® Captioning and DVS Theatrical® and check out the list of theaters that have MoPix® equipment installed. InSight Cinema (insightcinema.org)–Nonprofit organization dedicated to "bringing the big screen movie-going experience to the 30 million deaf and hard-of-hearing (DHH) and English-as-a-second-language (ESL) audiences in the United States." InSight is a leading advocate of open-captioned films and provides weekly updates to consumers looking for open-captioned films at theaters in their area. Also available is a list of theaters that provide open-captioned movies and a Google-based map listing of open-captioned movies and directions to theaters. Fandango (fandango.com)–A popular movie listing site that identifies showtimes for movies available with open captions. Simply visit their Web site, enter your ZIP code, and look for the specially tagged "open caption" listings. Your local movie theater and the major movie studios need to hear from you that equal access to movies is needed, and that it's needed now! In a blog post from the vice president of the American Foundation for the Blind, read about what can happen when you make the right contacts. We are working with several organizations to develop ways that Horton Hears a Who can be incorporated into your RCAA celebrations, and will keep you posted with updates as they become available. We hope to use this opportunity to advocate for access in more theaters! The DCMP is administered by the National Association of the Deaf. Funding for the DCMP is provided by the U.S. Department of Education. This newsletter is distributed to DCMP clients and other interested persons. You received this message because you are a registered DCMP member and have elected to receive e-mail communications. You can manage your e-mail preferences by logging into the DCMP Web site and visiting the "My DCMP" section.